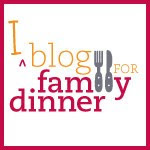 I've been posting a lot of interesting news, research and tips about family dinner on my Facebook fan page (Eat Dinner.org) and Twitter (eatdinner). Here's a few recent links. Happy reading! New Kids Mag: Chop Chop: Getting Kids in Kitchen always a good idea! 10 pitfalls to avoid for picky eaters, no.8 is the best. bring that baby to the table! University of Minnesota Study on Parenting Styles and Family Dinner: Authoritative Style (set rules and routine, but also empathetic and listening) did best with family dinner. Picked up by Babble Editors and many others. Official press release here.